I've been sorting through my dad's collection of odds and ends. Now and then I'll find something interesting and give it to Maria. 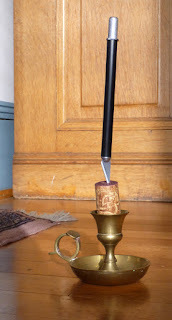 Although this is a bit off topic, I wanted to show you what Maria did with a piece of broken silverware and a brass candle holder. The broken silverware handle immediately became an elegant pencil extender. What to do with the candle holder? We use exacto knives all the time. How to store them safely and stylishly within easy reach and not dull the point? 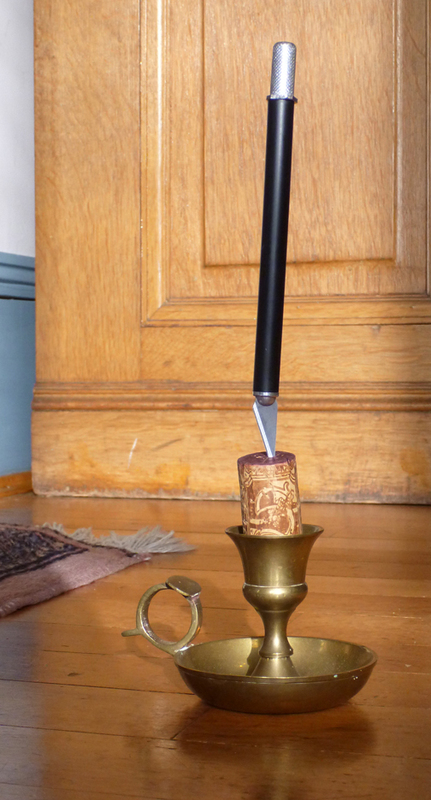 Grab a wine cork and . 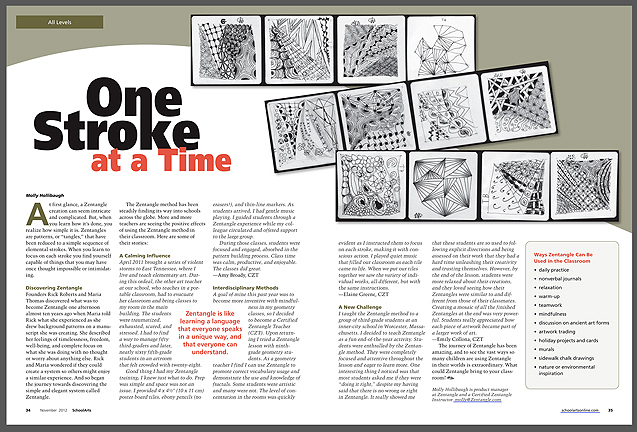 . .
That's the title of an article that Molly Hollibaugh, CZT, and Zentangle Product Manager, wrote and which appeared in the November issue of School Arts Magazine. 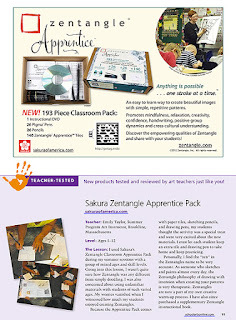 We invite you to take a moment to read her article and enjoy comments from Molly and other CZTs about teaching the Zentangle Method to students in the classroom. There's also a "Teacher Tested" section with some insightful comments about our Apprentice Classroom Pack on page 11 of that same issue. Click links for a great read. 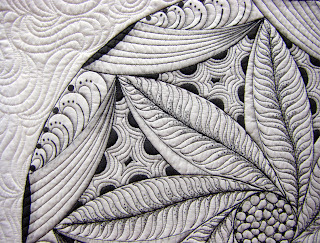 I have attached photos of my latest wall quilts inspired by Zentangle. 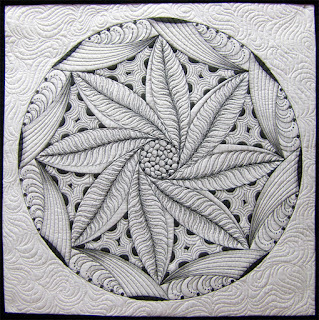 My Zen Quilting students are wanting to taking their little 8 1/2" Zen Quilts to the next level so I have worked up a Zen Mandala Workshop just for them with 20" wall art pieces. You will recognize that the first one is based on one of your gorgeous Zendala Set tiles (always credit you for this) and the other is my own star based design. Hope you enjoy them. 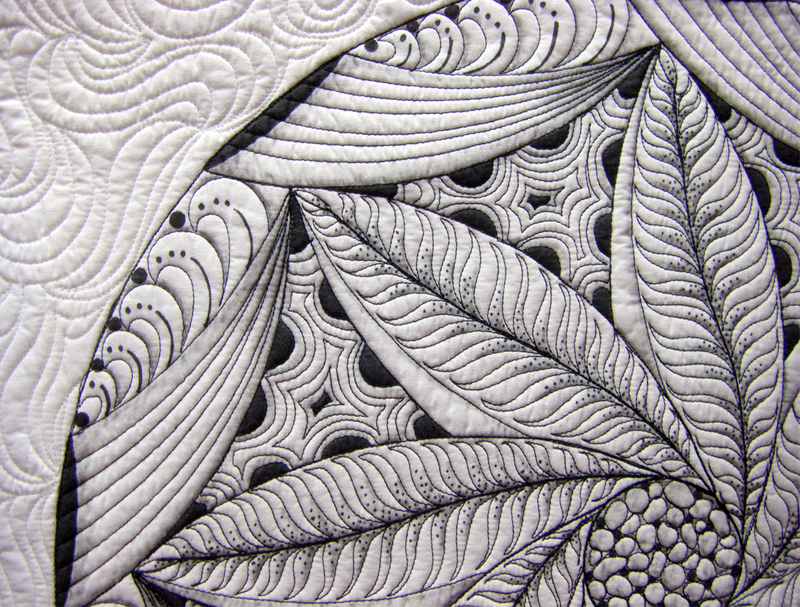 I can't tell you how much Zentangle has enriched my machine quilting skills and opened up the creative floodgates. 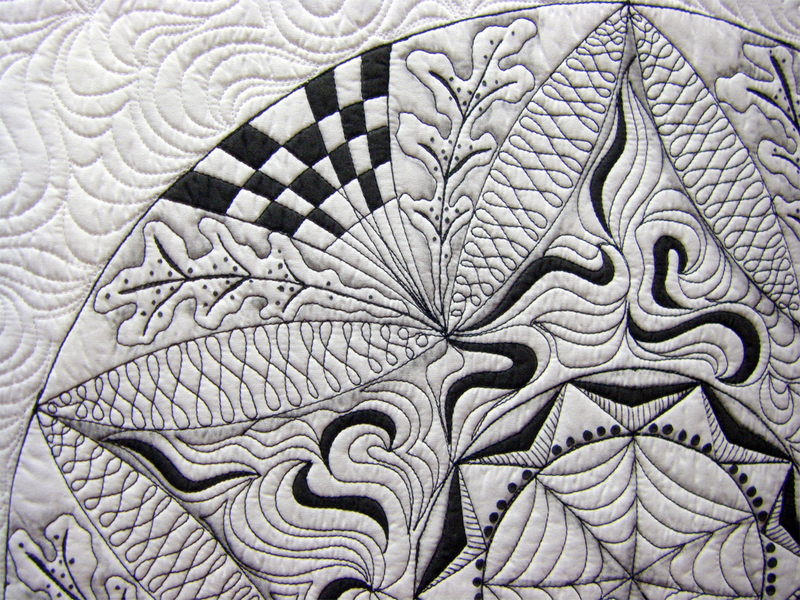 If I get stuck on a quilt, I just tangle until I come up with something new. 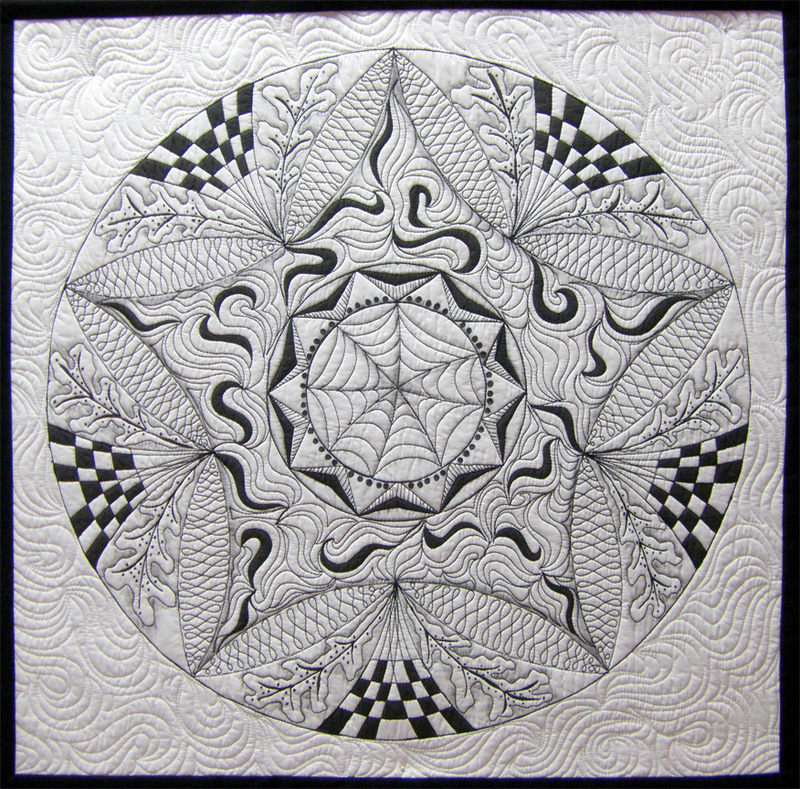 My customers are awed by the array of quilting designs that I am working onto their cherished quilts, making each one unique. 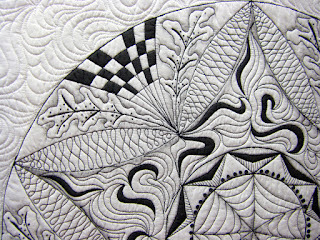 You can see more of Pat's work, books, and classes at her website, patfergusonquilts.com. Thank you, Pat, for sending us your comments and those beautiful images. 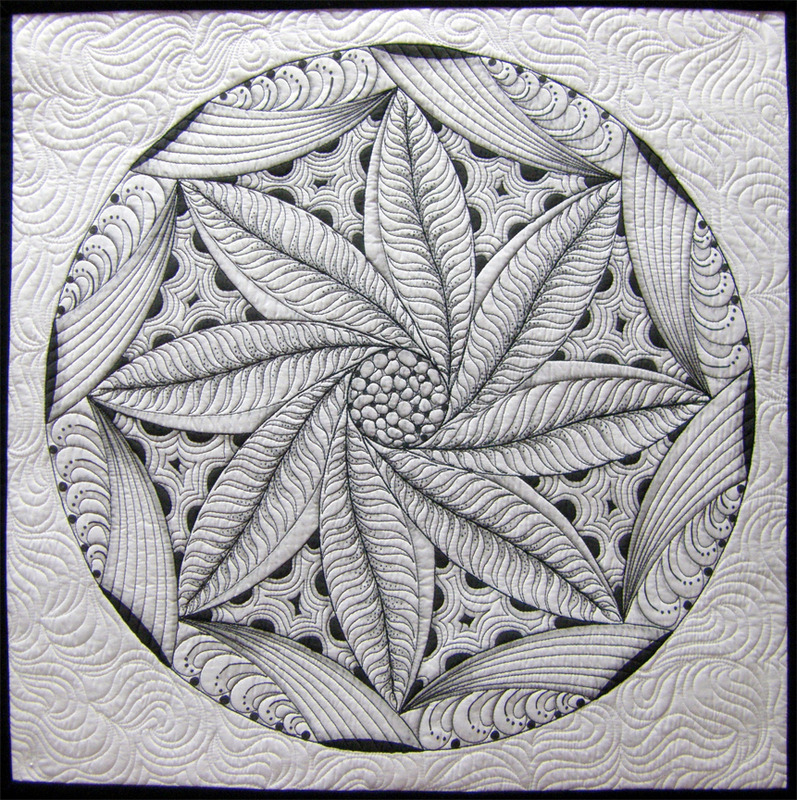 You can see more samples of Zendala tiles and strings in this newsletter. 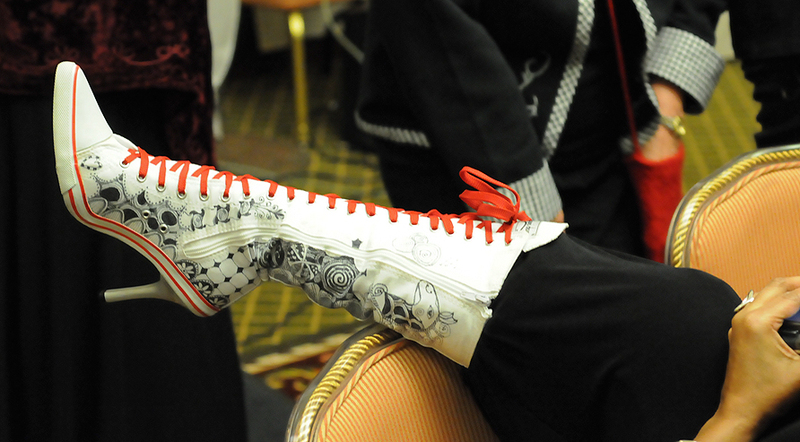 I am an artist and an athlete, inside my mind. The artist, thanks to Zentangle, is beginning to emerge and I am hoping the athlete is not far behind. I will blame two things for my delayed art emersion, a brother that wielded crayons like Picasso and an assortment of evil Spirograph toys. Each and every Spirograph I received over a span of birthdays had faulty pens. I don't believe I had success completing even one project. Now, my faith in drawing has been renewed. Your simple to follow techniques have shown me that I can finish a project to be proud of. My husband loves my drawings . 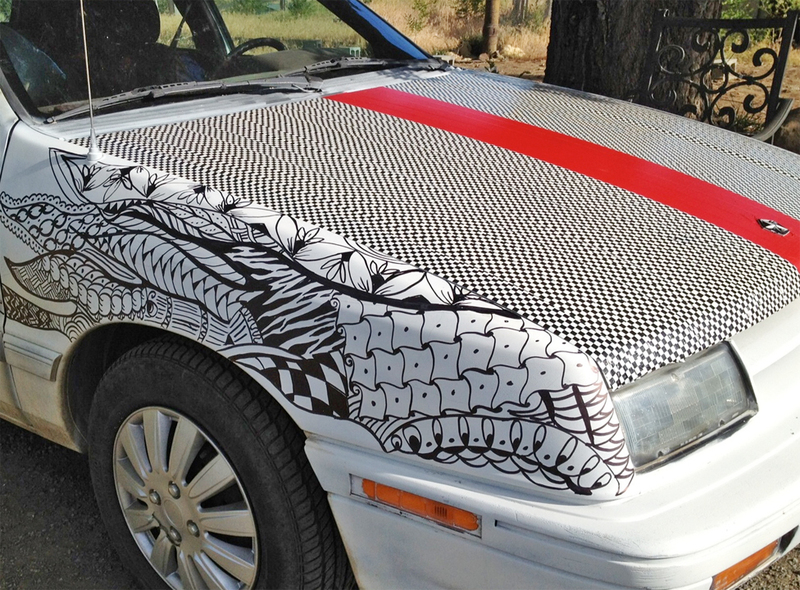 . . well, he did until I used his car as a canvas. Did you realize that Zentangle flames on a Dodge shadow are somewhat of a conversation starter? I always knew approximately what part of town my husband was in because I'd receive texts that said, "Hey, I just saw your husband's car." A young man recently bought said car and digs the drawings. I thank you for having the insight to put the instructions together and show a technique that can . . . 'one stroke at a time'. 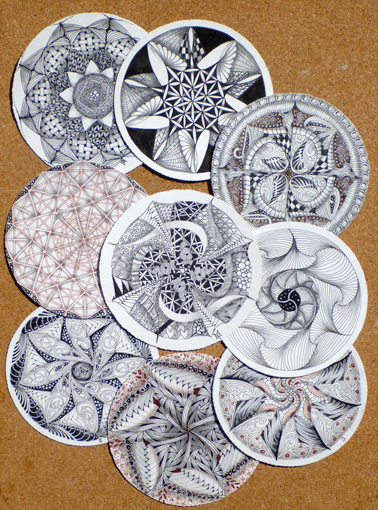 . . erase my fear of drawing as well as put my Spirograph ghosts behind me. P.S. The hood is duct taped. My husband is a good sport. 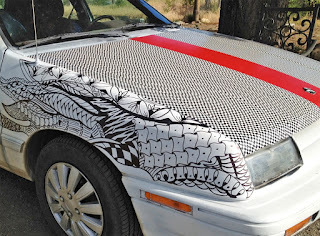 Maybe that is why he brought home another blank canvas, ummm I mean, white car. 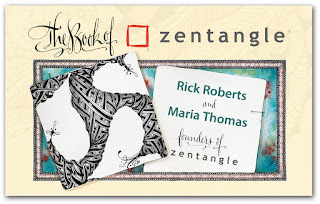 Just a quick note to let you know, or so that you can pass on to anyone you know in the area, that we will be doing a book signing for The Book of Zentangle on Saturday, November 24, in Westborough, Massachusetts, from 1:30 to 4:00 pm. 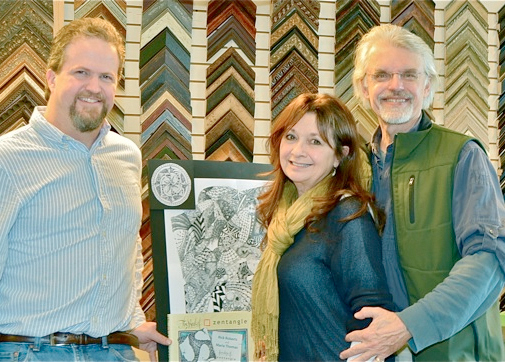 The Art and Frame Emporium is located at 18 Lyman Street in the Westborough Shopping Center. Ed Turner, CZT and owner on left with Maria and Rick. 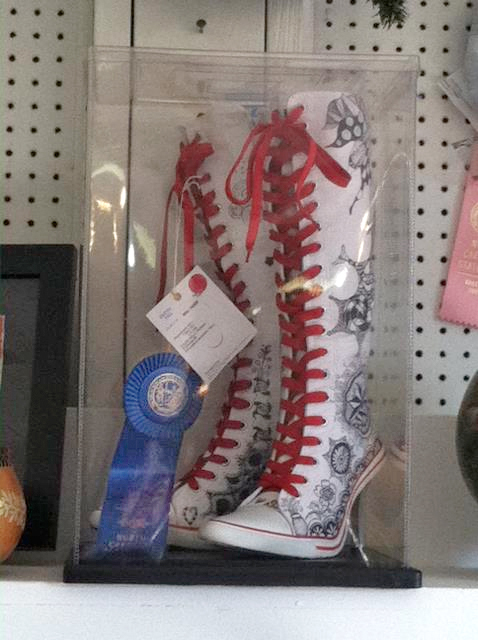 Sharon Payne, a Certified Zentangle Teacher in North Carolina (USA), recently won Premium First Place Blue Ribbon at the 145th North Carolina State Fair for her Zentangle inspired boots. Here's Sharon at CZT training . . .
. . . and a closer look at those boots. 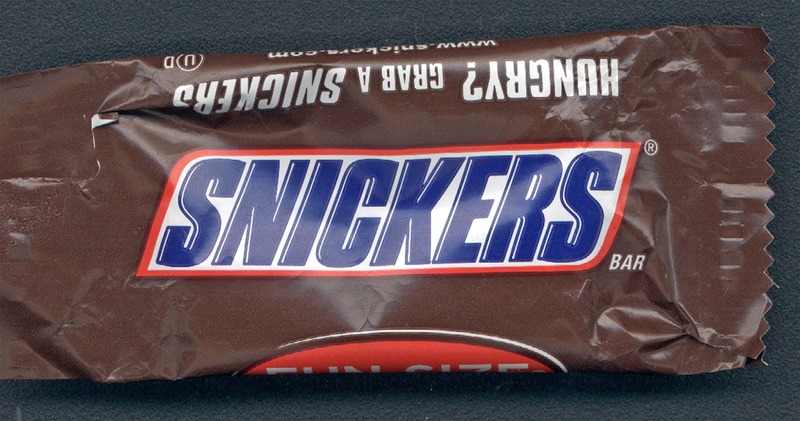 We had some little candy bars left over from Halloween treats, so I decided to try a tiny Snicker's bar! Much to my surprise on the bottom of the candy was a cute Zentangle surprise. 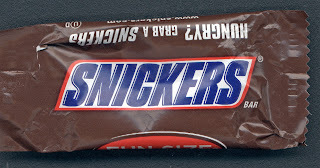 I've attached a photo of the wraper and the candy bar bottom! 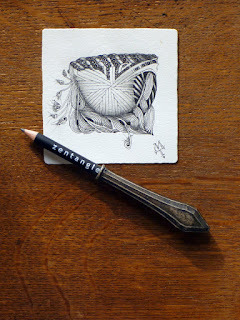 This is a great example of one of Zentangle's wonderful side-effects: an increased awareness and appreciation of pattern and design that was previously overlooked. 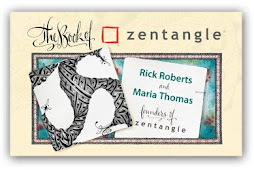 We will often hear from new Zentangle practitioners that all of a sudden they are noticing and enjoying a beauty that's always been there, but never "seen"–just like this version of our tangle static. Thanks so much for sending that, Elsie! 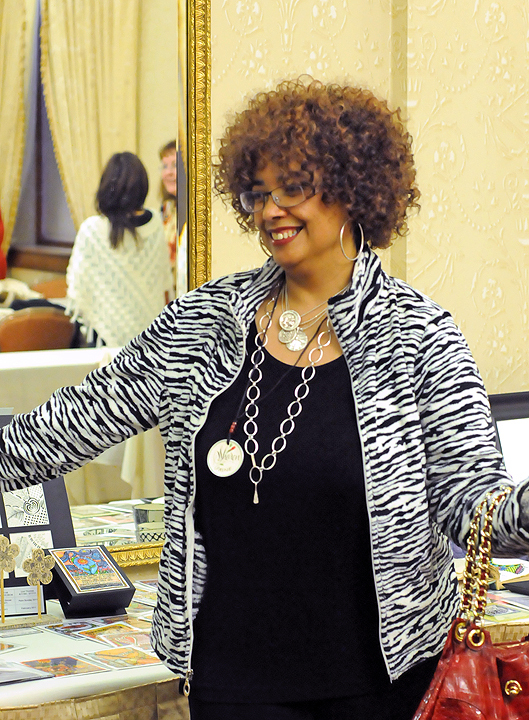 Scrapbooking.com has a regular "Meet the Artist" section on their website and this month we are honored to join their list of interviewed artists. Follow this link to read Judi Kauffman's write-up of her interview with us. She really caught the mood and spirit of our recent conversation. It's a wonderful read. 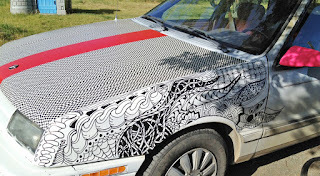 That image above was taken by Bette Abdu, CZT, during a Zentangle Master Class as we rode around Newport, RI in a trolley, hunting for patterns in area museums and mansions. You can read about it (and see a larger image) here. 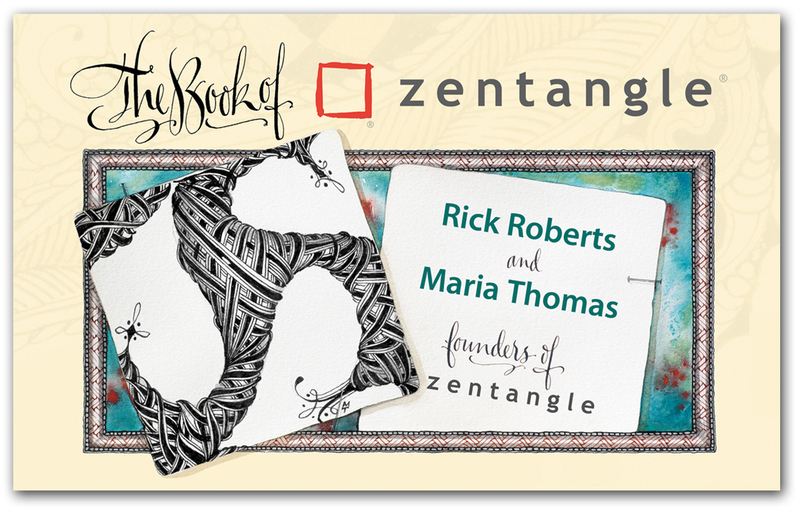 The other images in the article are two of many illustrations that Maria created for The Book of Zentangle. Click link for a good read! Pokeroot was one of our first tangles. It was inspired by a pokeroot plant growing in a vacant lot across from our home. Pokeroot is an unusual name for us to use for a tangle because it is named for what inspired its pattern. We usually choose names that don't create a preconception of how a tangle should look. John also admonishes, "If you find yourself inspired to mash and draw, please keep in mind that the Pokeweed berries are toxic." Over time pokeberry ink turns from purple to tan. You can see this in the Declaration of Independence which Thomas Jefferson wrote using pokeberry ink. 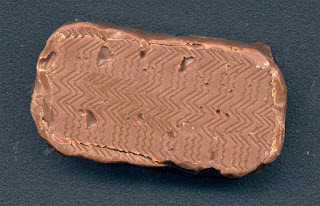 Letters written with feather quills in pokeberry ink by Civil War soldiers are still legible. Supporters of U.S. President James Polk wore pokeweed twigs during his campaign. Similar sounding "Polk" and "poke" are sometimes used interchangeably in reference to this fascinating plant. 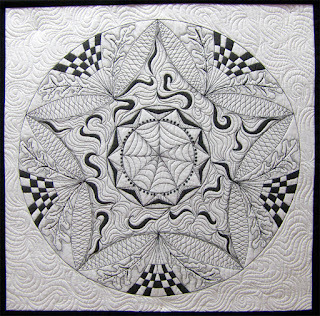 Here's some "tangling" music for when you tangle pokeroot. We invite you to visit John's blog entry to read his full story and to leave a comment.